A challenging project, the original building was a distillery, an has since been used as apartments, a warehouse, and office space. 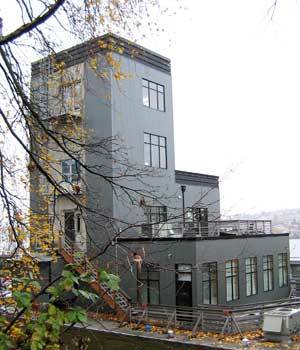 The aim of the renovation was to a create a attractive office space with views of Lake Union, as well as revamp the exterior. The goal was accomplished by enlarging and adding windows, and creating loft area. The interior was finished with a “industrial look”, decks were added to the flat roofs and the lobby improved to feel more inviting. The building, located in a congested area of downtown Seattle, is poured in place concrete, making the saw cutting and removal of the concrete, very challenging. The project was completed on time and without error.